I've decided to make 52 little houses from scraps, one for each week of the year. I'm busy stitching the 6th this week, so a picture of the 5 already done is at it's place here. I chose the fabric for the sashings and I think it comes out very nice. My grandsons 'ordered' a cushion for Christmas. They chose the figures from fatcatpatterns. The little one wanted a car as he is mad about them, it had to be yellow as it is his favourite colour. The middle one chose the fabric and the gecko. 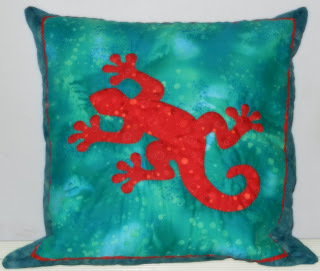 He already ordered a gecko quilt! 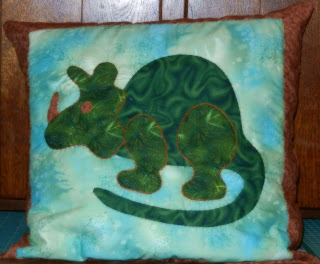 And the oldest one is crazy about dinosaurs since he was a little kid, so the chart was chosen quicxkly. They all were very happy with their cushion. I want to make a quilt for myself in red, my favourite colour. I made the first block, itis in combination with white and black. I'll need to make many more blocks, but it looks so nice that I think that won't be a problem. The last picture is from the latest workshop, it will be a map to put blocks in the making and ready made in it. You never can guess what my favourite animal is... The red fabric is a fairy favor from an American Yahoo pal and it is so nice in combination with the catfabric. I will show more of it when it is finished.